Hey! It's Lisa here to welcome our next guest author Rae! She has a wonderful article about building relationships between parents and teachers. Be sure to read to the bottom for some wonderful freebies! My name is Rae from Mindful Rambles of a Special Educator. I have been a special education teacher for 8 years now and every day is a surprise! One of the toughest things any educator has to deal with on a day to day basis (special ed or not) are the parents. Often times parents will be difficult to work with, or worse - not present at all. Coming from a special education background, I found that a lot of my parents have had such negative experiences with their child's education. Between fighting to get their kids services, or desperate to steer their child aware from a dreaded "label", it takes a toll on the relationship between teacher and parent. Today, I want to talk about parent-teacher relationships, communication and parent involvement. This post will be focused on gaining parents' trust, getting them involved in their child's education as much as possible, and building a strong ally in your classroom's parents. Keep Calm: It is so important that, as the educator, you are the calming voice in the conversation. These parents are emotional - it does you no good to become emotional yourself. You need to be the presence in the conversation that is sound and even-tempered. Just as you would with your kiddos to help regulate their emotions, do the same with their parents. Be Sympathetic: Put yourself in their shoes (or be empathetic if you've been through a similar situation). Imagine you are the parent of a child who is struggling - what types of emotions do you think you would be experiencing. Often times, I would hear parents talk about their struggles with school districts, hospitalizations, social rejection, and the like, and though I couldn't relate, I could sympathize. Having this mindset going into a parent meeting, IEP, or phone call home can really make you appreciate the parent, situation, and their need to be heard. Validate Their Feelings: Whatever the parent is going through, it has validity. It doesn't matter if you think they are overreacting or just being ridiculous. You don't have to agree with them, but you do need to validate their opinions, emotions, and words. There is nothing more frustrating than having someone belittle or patronize your feelings. Sometimes all we need is to be validated. Listen: Have you ever gone home to your significant other complaining about your tough day? Usually, all you want to do is complain and vent, not to solve any issues. This is the same with many parents. Often times, there is no solution, or if their is, the parent is not at the point in which they are ready to accept the help. Lots of times, parents just need someone to listen to their feelings and concerns. This do NOT translate to "allow a parent to berate you"- you need to use your discretion. However, a listening ear goes a long way to building a positive, trusting relationship. Support: This is a no-brainer - but be supportive. This will look different in different situations. You may just be there to listen to the parent - that may be all they need. 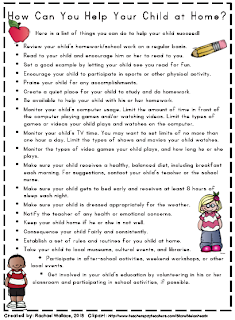 You may provide them with suggestions for interventions to use at home. You may refer the parent to other resources and/or services the school may provide. You may even just provide a personal (not too personal) story about a time you went through something similar. Anything that you can do to show your support will go a long way! To get a free list to send home to parents, click the image at the bottom of this post. Have a set day that you call parents. This is not always feasible -especially with a large classroom, but it can go along way. I have a smaller class-size, so I am able to set aside one day a week that I am going to make parent phone calls. These phone calls are not for behavioral updates from the day - those are handled the same day they occur. Instead, these are just to check in with the parent, give them an informal update on their child's school week. I usually try to provide a funny quote and positive moment from the past few days. With a larger group of kids, I would do split your group into 2, and call each group every other week. I understand that this is not always doable - that is a lot of time and effort when you have so many other things you need to do! If you are able to provide the time, I would consider doing so. If not, look at the other suggestions below. Weekly Notes. This can be a weekly journal, or simply an end-of-the-week note home. The important thing with these notes is that the student is filling them out as well! Each day (I do this at the end of each school day), have your students log each day's happenings on the sheet. This can be as informative or instructional as you would like. On Friday, have the students take the sheet home and review the information with their parents. I have provided a sample of a Weekly Notes sheet for free! Click the image at the bottom of this post. Daily Point Sheets. This is a main-stay in many special education classrooms, but can be beneficial to other classrooms as well. This is a way that teachers use to communicate with parents daily on their child's day, without having to make a phone call every day. 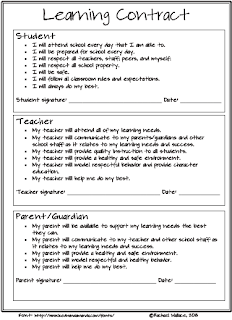 These sheets can be as informative as you want - I like to include academic goals as well as behavioral checks. 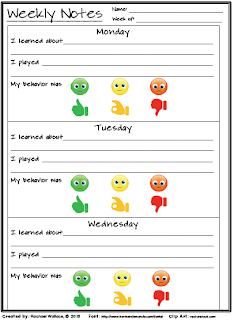 I also like to have student reflections as well as teacher reflections, so the student is held accountable, and the parent can see how the student perceived his or her day as well. Call for both negative and positive updates. Many parents dread the phone call home. It often means their child has either done something wrong, or is the victim of another's wrong-doing. This doesn't have to be the case! Call home randomly to tell a funny story or something kind that the student did that day. I love to call home when one of my student reaches a new academic achievement, like a new reading level, or passes their math facts tests! The more you call for positive reasons, the less likely they are to ignore your phone calls. Thank You Notes. have students write thank you notes to Parent Volunteers (see below). Make sure you include your own special acknowledgement. Announce special school programs, activities, fundraisers, field trips, special visitors, etc. List your class rules, homework policies, Goal of the Month, etc. Parent Volunteers. At your Open House, Back to School Night, or Parent Conferences, have a sign up sheet for parents who are interested in volunteering in your classroom. This is not only a great way to get parents involved, but also can be a big help for you! Have specific tasks designated for Parent Volunteers (such as Bulletin Board displays, grading papers, laminating and copying, preparing supplies for lessons, etc.). You may even consider holding a mini "workshop" to inform parents of the class schedule, scheduled activities, upcoming projects, student groupings, and your expectations of all school subjects (both academic and behavioral). Leaning Contract. This may not seem like a way to get parent's involved, but it shows that you care about the students' well being. By providing a contract to students, you are communicating to parents that you value their child's success while asking parents to hold their child accountable at home. By having this document, you can communicate with the parent about behavioral issues while referring to the contract that the parent is already aware of. These are no surprises, which parents can appreciate! Want a free Learning Contract? Click the image at the bottom of this post. Parent Days. In the past I have done special Parent Breakfasts, Parent Lunch, Parent Read Alouds, or simply Parent of the Day. These different days are ways to celebrate our parents. It doesn't have to be much - just a simple invite to come in and read a story during snack time is sometimes enough to show you care about them. Not all of your parents be able to participate, or even want to. That's okay. It's the thought that counts. Door Prize. At your open house, encourage attendance by offering a door prize to those who attend! It can be something simple such as a gift card (or even a coupon to a local restaurant), a game for their family, or an activity to do with their child. Not all parents are going to communicate, be honest, or be present- Don't take it personal! Not all parents are going to read your notes home and/or pick up the phone - no matter how sweet or caring it may be. Again - don't take it personal! Building this relationship up front is crucial! Not only will you have time to build your relationship, but by the time any meetings, especially IEP meetings, come around, you will have the support of a caring parent, and will be able to support them in return. I hope you found this post was informational! 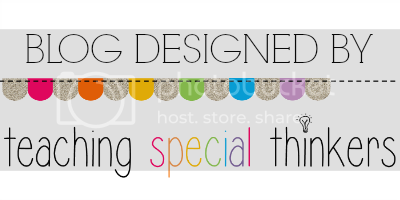 For more posts on classroom management, special education, and the like, come visit me at Mindful Rambles of a Special Educator! Also, for more freebies, head on over to the Mindful Rambles Facebook page for exclusive Fan Freebies!